This reissue of the Collins English Thesaurus is the perfect reference for everyday use. With practical usage notes, and a fantastic supplement, this is the ideal thesaurus to take your language use and knowledge further. This reissue of the Collins English Thesaurus is the perfect reference for everyday use. With practical usage notes, and a fantastic supplement, this is the ideal thesaurus to take your language use and knowledge further. Specially tailored to meet the needs of the user at home, school, or in the office, the Collins English Thesaurus has all the words and alternatives the user might need, as well as a huge choice of opposites. 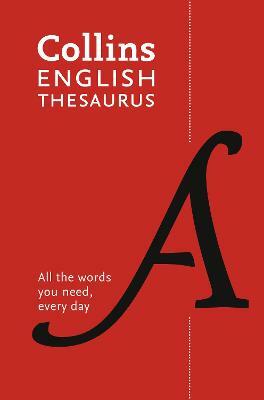 This thesaurus is based on the Collins Word Web, Collins' 4-billion-word database of today's English. The clear, accessible layout makes the thesaurus easy to use and ensures users can find the language they need when they need it. This reissue also includes a new supplement.